Image is photo with text. Photo is a close-up of a baby's seat in a emerald and off white woven wrap Risaroo Dogwood Emerald. Off to the side is text that states quote Glossary of woven wrap terms and acronyms with Amy Wraps Babies end quote. Learn how to describe a rectangle first at Wrap Parts. Find out the size wrap you need and what "base size" is at Wrap Sizes. 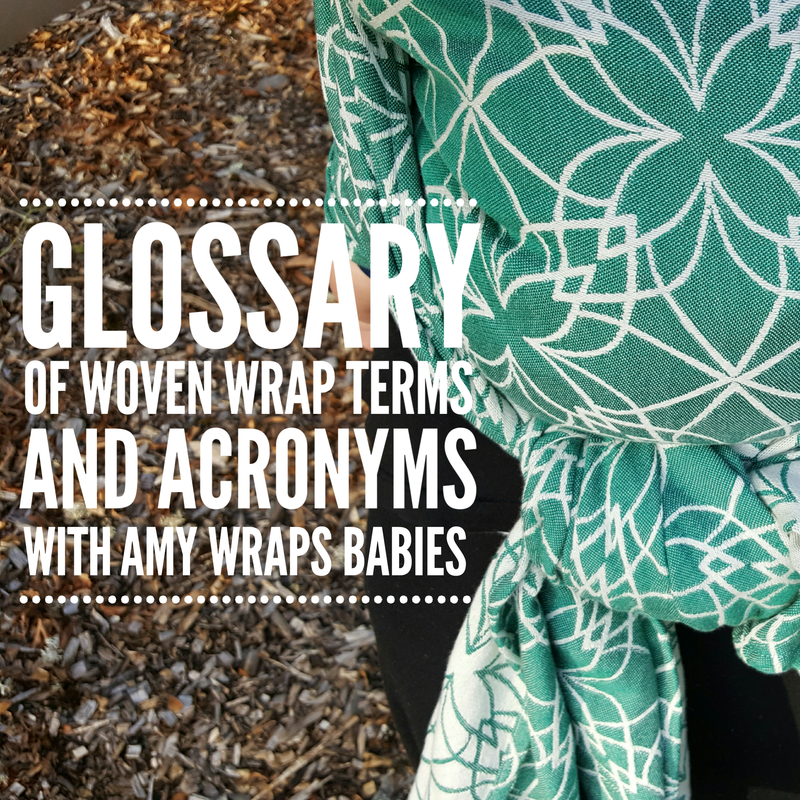 Then if you want to dig more, learn about the Wrap Passes that make up the carries and the Wrap Qualities that describe fabric. Disclaimer: The babywearing lexicon is dynamic, with new terms being added all the time. If you are looking for a term that isn't defined let me know - I'd love to add it! Airy - a wrap quality. Airy wraps have a loose weave. Antonym, dense. See the Wrap Qualities page for more specifics. Back Carry - a method for carrying with the wrappee facing the wrapper's back, tummy-to-back (baby's tummy to wrapper's back). Base - refers to your base wrap size. This is the size with which you can tie a Front Wrap Cross Carry. See Selecting a Wrap Size for more. Bounce - a wrap quality. Bouncy wraps have a little bit of stretch, some cush, and recoil. Antonym, flat. See the Wrap Qualities page for more specifics. Bottom Rail - the hem at the bottom of the wrap. It spans the entire length of the wrap. See Wrap Parts for a visual. Break in - the process of a fabric evolving from "loom state" to "floppy." Broken thread - a thread in the wrap's weave that has been cut. Unlike a pulled thread that has an obvious loop. Can be repaired by tying the two ends in individual knots. Bunched - pass with the wrap bunched up or gathered, rather than spread across baby (spread = "reinforced"). See Wrap Passes for visuals. Carry - a combination of passes; also refers to how the wrap is tied on. For example, Back Wrap Cross Carry, Double Hammock Carry, etc. Churn/churner - the act of buying and selling or trading wraps. Churners gonna churn means people who like to buy/sell/trade are eventually going to give up the wrap they have for something else. Colorway - the color(s)/color family of the wrap threads. Not to be confused with the wrap pattern, which is the design of the wrap and can come in a variety of colorways. Cush - a wrap quality. Cushy wraps have a "marshmallow"-lie quality. Antonym, flat or dense. See the Wrap Qualities page for more specifics. Dense - a wrap quality. Dense wraps have a tight weave. Antonym, airy. See the Wrap Qualities page for more specifics. Dry - a textile quality. Antonym, soapy. See the Wrap Qualities page for more specifics. Edges - hems that run the length of the wrap; top edge and bottom edge. Also called "rails." See Wrap Parts for a visual. Fancy Finish - tying the tails of a wrap in a visually striking way such as Saltwater Finish, Candy Cane Chest Belt, etc. (Show us your fancy finishes on Instagram by tagging #fancyfinishfriday!). Floppy - a broken-in wrap: soft, literally has "flop" to it and it feels like wearing an old pair of blue jeans. See the Wrap Qualities page for more specifics. Front Carry - a method for carrying with the wrappee facing the wrapper's front, tummy-to-tummy/chest (close enough to kiss! See ABCs and Ergonomoics for more on that rule). Glidey - a wrap quality, aka Slippery. Glidey wraps make for very easy passes (passes slip over each other well). Antonym, gripy. See the Wrap Qualities page for more specifics. Gripy - a wrap quality, aka Sticky. Gripy wraps hold knots well and have a certain "stickiness" factor. Antonym, glidey. See the Wrap Qualities page for more specifics. Hip Carry - a method for carrying with the wrappee facing the wrapper's side or hip. Hip Scoot - a way to get baby on the wearer's back, typically used for older and heavier babies (older than 6 months). See the Tutorials page for a visual. Hold - the position of the wrappee in the wrap. Vertical or tummy-to-tummy is the recommended hold for all carrier types (with situational exceptions). "Hold" is often referred to as "carry" which can be confusing, so on this site "hold" will always refer to the position of the passenger while "carry" will always refer to the combination of passes used to restrain- uhh I mean -secure a wrap passenger. Leaner - a wrappee who pushes against the wearer and/or leans back away from the wearer. If not properly secured, leaners may injure themselves by leaning too far. Don't worry! There are great passes to secure a leaner - see the Wrap Passes page. Leg Straightener (aka Seat Popper) - a wrappee who will take their legs out of the recommended "M" position (see ABCs and Ergonomics) by pushing them straight down, thereby pulling the bottom rail of the wrap out from underneath them and causing it to ride up their back. This is dangerous because the seat of the wrap comes undone, giving the baby no support against gravity. Don't worry! There are great passes to secure a leaner - see the Wrap Passes page. Long wrap - a long size wrap, usually base to base+2. See Wrap Sizes for more. Loom state - a fabric straight off the loom. The fibers still have a coating on them from weaving. The wrap should be washed before use. Middle Marker - small tag in the middle of the wrap's length that tells you where the center of the wrap is located. Only some brands have a middle marker on the bottom rail but all will have one on the top rail. Usually it is sewn into the hem on the "wrong side" of the wrap. See Wrap Parts for a visual. Moldable - a wrap quality. Moldable wraps easily conform to the wearer's shape. Antonym, stiff. See the Wrap Qualities page for more specifics. 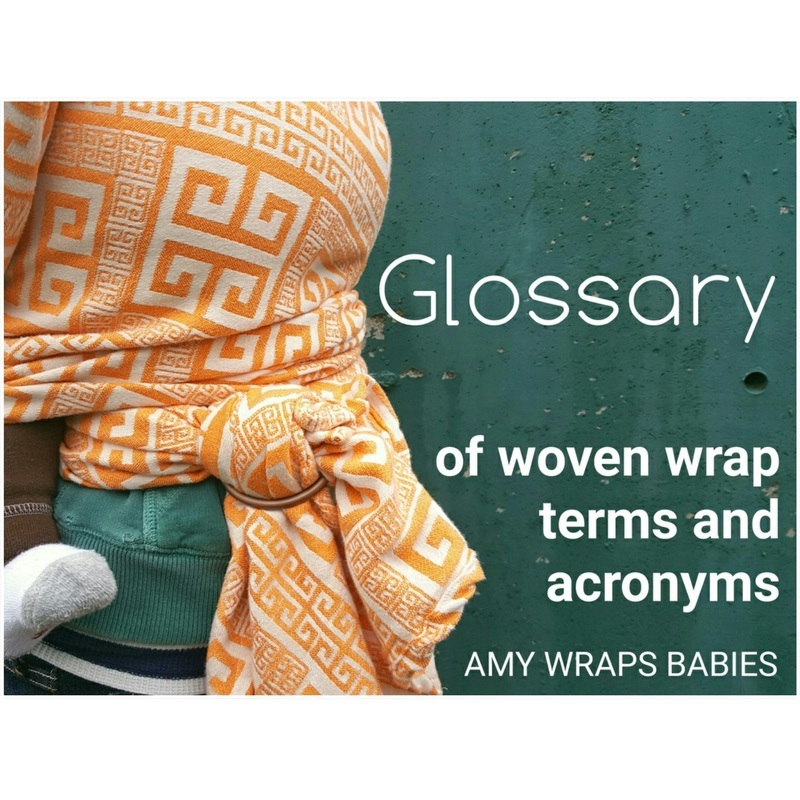 Pass - any length of wrap that spans from one part of the wearer's body to another. See Wrap Passes for examples of each type of pass. Pattern - the design of the wrap; can come in a variety of colorways. Permastash - a wrap the owner intends to never sell or trade. "Stash" is an ableist term and therefore many have chosen to retire use of this term (but still keep the wraps of course). See the Resources page for more on ableism. Pulls/pulled thread - a thread that has been pulled out of the wrap's weave. Is a cosmetic flaw only (unless there are multiple pulled threads or the thread has been pulled very far from the weave). Can usually be easily repaired. Rails - hems that run the length of the wrap; top rail and bottom rail. Also called "edges." See Wrap Parts for a visual. Rebozo - a type of shawl or woven wrap, usually around 2-2.5 meters long (so about a size 2 wrap). A handwoven shawl specific to Mesoamerican cultures. Can also refer to a Rebozo Pass, now referred to as a Sling Pass - see Wrap Passes for a visual. See wearingwiki.com for #takebacktherebozo information. Recoil - a wrap quality. Wraps with recoil tend to have stretch, cush, and bounce. Antonym, flat or dense. See the Wrap Qualities page for more specifics. Reinforced - pass with the wrap spread out across baby rather than bunched up. See Wrap Passes for visuals. Repreve - a fabric made from recycled bottles. Made by Repreve. Right Side - the "presenting" side of the wrap. The rail hems fold away from the right side so the stitching is usually not visible. See Wrap Parts for a visual. Ring Finish - use of a sling ring to secure two tails of a woven wrap together instead of using a knot. Ruck - a very simple and quick carry. See the Tutorials page for a demonstration. Also refers to ruck straps, meaning a pass that starts over one shoulder, glides across baby's back and ends over the wearer's opposite shoulder. See Wrap Passes for visuals. Saggy - a wrap quality. Saggy wraps do not hold their shape even after tightening the passes. Antonym, supportive. See the Wrap Qualities page for more specifics. Santa Toss - a way to get baby on the wearer's back, typically used for small babies (less than 3-4 months - make sure you've mastered front carries before wearing babies of any age on your back and that you are a very experienced back wrapper before attempting to back carry). See the Tutorials page for a visual. Seat - a "hammock" of fabric between the wrapper and wrappee that securely protects the wrappee from gravity. See the Tutorials page for a visual. Seat Popper (aka Leg Straightener) - a wrappee who undoes their seat, usually by taking their legs out of the recommended "M" position (see ABCs and Ergonomics) by pushing them straight down, thereby pulling the bottom rail of the wrap out from underneath them and causing it to ride up their back. This is dangerous because the seat of the wrap comes undone, giving the baby no support against gravity. Don't worry! There are great passes to secure a leaner - see the Wrap Passes page. Shifting - see Thread Shifting. Shortie - a short wrap, typically base-2 or shorter. See Wrap Sizes for more. Skipped thread - a weft thread skipped, will appear as a blemish along the width of a wrap. Sling - wraps and ring slings are commonly referred to as "slings" or, for wraps, "wrap-around slings." This term also refers to the sling pass which starts over one shoulder and ends under the wearer's opposite arm - see the Wrap Passes page. Sling Ring - a ring of aluminum or nylon (typically), from 2-3.625 inches in diameter, used to secure the tails of a wrap instead of a knot. Two rings are used for a ring sling and one ring is used to "tie" two tails together with a woven wrap (the latter is also refered to as a Ring Finish). Purchase rings at Slingrings.com. Slippery - a wrap quality. Slippery wraps can feel silky in hand. Antonym, textured. See the Wrap Qualities page for more specifics. Smooth - a wrap quality. Smooth wraps can feel silky in hand. Antonym, textured. See the Wrap Qualities page for more specifics. Soapy - a textile quality. Antonym, dry. See the Wrap Qualities page for more specifics. Squish - a term for newborn babies. Stash - an outdated an ableist term for a collection of wraps and carriers. Please use the word "collection" when referring to your personal group of carriers. Stiff - a wrap quality. Stiff wraps will often form peaks in their pleats instead of making nice easy pleats. Antonym, moldable. See the Wrap Qualities page for more specifics. Stocking - an event during which new wraps are released from a company. Some companies have weekly stockings, some are less frequent or sporadic. Stockings typically consist of one wrap pattern (like a cotton purple weave) or one wrap type (like a line of ring slings). Superman Toss - a way to get baby on the wearer's back, typically used for small babies (between 4 months and whenever they get too heavy to comfortably "toss" - make sure you've mastered front carries before wearing babies of any age on your back and that you are a very experienced back wrapper before attempting to back carry). See the Tutorials page for a visual. Supportive - a wrap quality. Supportive wraps hold a lot of weight without slippy (when passes are tightened appropriately). Antonym, saggy. See the Wrap Qualities page for more specifics. The Swap - The Babywearing Swap facebook page is a common resource for buy/sell/trade opportunities. See more groups in the Communities page. Tail - the end points of the wrap. Usually referred to as "long tails" when a lot of the wrap is hanging down after the carry is tied or "short tails" when there's only a bit of wrap left after tying. See Wrap Parts for a visual. Tandem wearing - wearing two children at the same time. Tapers - the angled ends of a wrap. See Wrap Parts for more. Tencel - a fabric made from recycled trees. Made by Lenzing Fibers. Textured - a wrap quality. Heavily textured wraps feel maybe a little bumpy or rough in hand and the weave is noticably bumpy or maybe looks like it has little pillows. Antonym, smooth. See the Wrap Qualities page for more specifics. Thick - a wrap quality. Antonym, thin. See the Wrap Qualities page for more specifics. Thin - a wrap quality. Antonym, thick. See the Wrap Qualities page for more specifics. Thread Shifting - A flaw where parts of the weave shift or move leaving thin spaces, or gaps in the wrap. More common in loose weaves. Can be caused or worsened by spin cycles. Top Rail - the hem at the top of the wrap. It spans the entire length of the wrap. See Wrap Parts for a visual. Warp - the vertical threads of a weave; there are many warp threads side-by-side in a fabric. See Wikipedia for a good visual and brief description. Wearer - the caregiver wearing the wrap. Weft - the horizontal or transverse thread in a weave; there is one weft thread going back-and-forth through the warp threads to bind them together. Aka, woof. See Wikipedia for a good visual and brief description. Wrap Qualities - the general feel of the fabric. See also breathable, cushy, diggy, grippy, saggy, stretchy, textured. See the Wrap Qualities page for more specifics. Wrappee - the baby/toddler/child/person being held up by the wrap. Wrong Side - the "back" side of the wrap. The rail hems fold toward the wrong side and are visible (think of it like the "inside out" of a t-shirt). In some wraps the wrong side contrasts beautifully with the right side which can make some carries look really fancy. See Wrap Parts for a visual. * Sling pass is the new name for the pass previously called "Rebozo", as it has been voted on by the babywearing community via wearingwiki.com. More information about why the change was made can also be found on that site.